DLL4 antibody LS-C19035 is an unconjugated rabbit polyclonal antibody to human DLL4. Validated for ELISA, ICC, IF, IHC and WB. Cited in 2 publications. DLL4 antibody was raised against synthetic peptide from human DLL4. An internal region of Human DELTA-4. This affinity purified antibody has been tested for use in ELISA, immunohistochemistry and western blotting. Specific conditions for reactivity should be optimized by the end user. Expect a band approximately 74 kD in size corresponding to DELTA-4 by western blotting in the appropriate cell lysate or extract. Anti-Delta-4 Antibody - Immunohistochemistry. 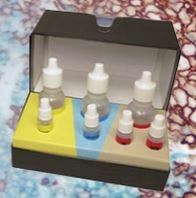 Affinity Purified anti-Delta-4 antibody was used at 20 ug/ml to detect Delta-4 in a variety of tissues including colon, liver, skeletal muscle, ovary, pancreas, prostate, testes, thymus, tonsil and uterus. 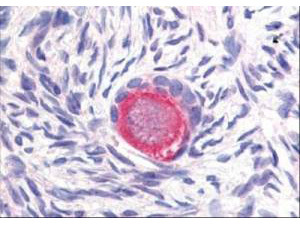 In contrast to reported findings, no staining was observed in vascular tissue. This image shows Delta-4 staining of human ovary. Tissue was formalin-fixed and paraffin embedded. Personal Communication, Tina Roush, LifeSpanBiosciences, Seattle, WA. Western Blot - Anti-Delta-4 Antibody. Western blot of Affinity Purified anti-Delta-4 antibody shows detection of a 74-kD band corresponding to Delta-4 in a lysate prepared from mouse pancreatic tissue. Approximately 20 ug of lysate was run on SDS-PAGE and transferred onto nitrocellulose followed by reaction with a 1:500 dilution of anti-Delta-4 antibody. Detection occurred using a 1:5000 dilution of HRP-labeled Goat anti-Rabbit IgG for 1 hour at room temperature. A chemiluminescence system was used for signal detection (Roche) using a 3 min exposure time.